With winter knocking on our doorsteps, it comes as no surprise that Microgaming chose to launch a series of Polar themed slot games. One of them is known as Polar Pioneers and all the symbols are consistent with the Arctic Circle, so players should expect to see plenty of polar bears, Huskies, pick axes and explorers while playing this game. The explorer represents the wild symbol while the huskies are the scatter symbol, and two of them trigger the new feature called 2nd Chance Respin Bonus Game. Basically what happens is that those reels that have the huskies on them will stop and only the rest will continue to spin. Players are rewarded with credits for hitting winning combinations and this happens before the respins and after them as well. The gamble feature was also introduced in this slot game, so players have the option of risking their profits for the sake of higher payouts. 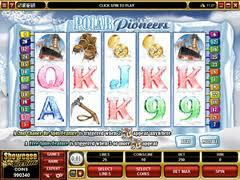 The game is presented in details at http://livecasinodirect.co.uk/casino-games/video-slots/review-new-online-slot-polar-pioneers/. This is not the only polar theme game released by Microgaming, with Polar Bash being just as amusing and potentially profitable. The idea behind this slot game is a party held by the animals, with symbols that include penguins, polar bears, walruses, whales, and huskies as well as snowmen and igloos. The scatter symbols are the North Pole and the fish, with the latter triggering the special Ice Fishing Bonus. When this occurs, players have to select three fish and depending on their luck they can win more or less bonus credits. As many as 25 free spins are awarded by the North Pole symbol and during these special rounds all payouts are doubled.